What a weird winter. Huge temperature swings this week meant that we got some absolutely torrential downpours on Wednesday and Thursday. Downpours that had nowhere to go because the ground is still frozen solid. So of course that meant that the water should go into our basement. This was stage 1: Wednesday night into Thursday morning. The water was coming from the wall in the front of the basement, where there is a crack that we already knew was problematic. We knew, from the inspection, that the slope of the grade all around the foundation was wrong and would need to be fixed. A few minutes with a shop vac took care of the worst of it, and then I turned the dehumidifier on to turbo and headed off on a work trip. At about 2pm on Thursday, I got back in town from my work trip and it was WAY WORSE. The wet spot you see above was gone, BUT! See, it was still raining. And the ground was still frozen, except in places where it wasn’t. And one of the places it wasn’t was the ground around the well that surrounded the outside of one of our basement windows. The water pushed the well away from the foundation, and then filed it up. Completely. Result? Water literally pouring in like a waterfall through the frame of the window, which is nearly 100 years old and was no way tight enough to prevent that. (Sorry, no more pictures, things got very busy and hectic from here! So yeah. Way, WAY worse. And luckily I was home to fix it before it genuinely flooded the basement. 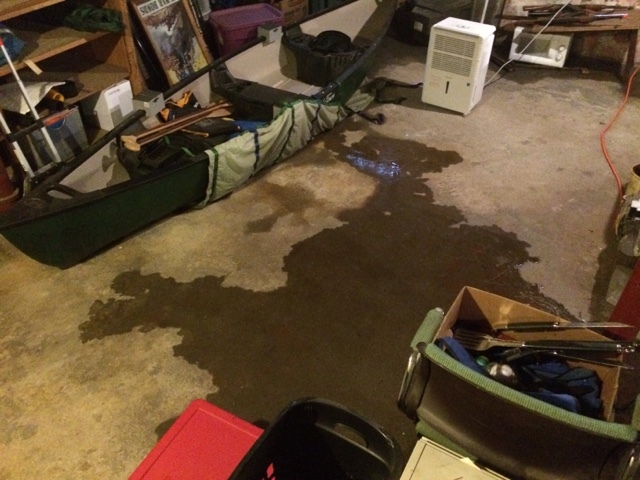 First things first: set up the shop vac again to start siphoning the water, and then I left it running while I sprinted outside with a plastic cup and then bailed out the window well by hand, pouring the water into the street about 15′ away so it would not just drain back in. I have no idea how many trips it took. Several dozen, until the water level was below the frame of the window. I checked back on the basement periodically – which required circling most of the house – and the shop vac was still going strong. Finally, the water stopped pouring in, and the shop vac reduced the standing water to just a broad wet spot. The dehumidifier was going strong and had already made good progress. I finished by pushing some mud around to fill in the gaps around the broken well – ineffective, but at least something – and then got a sand bag from the basement to brace the mud and hopefully divert the stream of water stil coming down the hill. Then I changed into new work clothes – the old ones being muddy and sweat-soaked, awesome – and headed to work for 2 hours. When I got home, the window well was muddy but empty of water, and the basement was well on its way to drying up. By Friday night, there were only a few damp spots left in the basement. So, that bumps our summer landscaping projects way up the priority list!